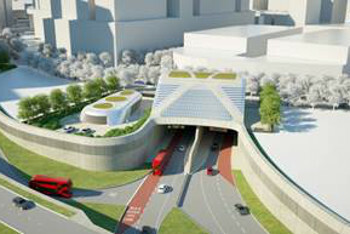 Chris Grayling has given the go-ahead for the controversial road tunnel under the Thames at Silvertown in East London, despite concerns over its impact on air pollution in the area. The transport secretary has made a Development Consent Order (DCO) authorising Transport for London (TfL) to proceed with the project following the recommendations of a panel last year. A decision from ministers was due last October but was first delayed by a month and then by a further six months to ensure its compliance with the Government’s national plan for tackling roadside nitrogen dioxide concentrations. The latest deadline expired today (10 May). In a decision letter on behalf of Mr Grayling, a Government official agreed with the Planning Inspectorate that the planned scheme provided benefits set out in the National Policy Statement for National Networks (NPSNN) in relation to relieving congestion, supporting growth and economic development, providing resilience and connectivity and therefore that, subject to policies and protections set out in the NPSNN, it met the document’s presumption in favour of granting consent. Although the Government’s air quality plan has since been overturned by the High Court, the letter noted that this did not impact the Zone Plan for the Greater London Urban Area. The transport secretary found that the tests on air quality in the NPSNN are valid and, despite arguments from opponents of the scheme, ‘that greater weight needs to be placed on the impact of the Development on the zone rather than at individual receptors’. Mr Grayling set a number of conditions, via modifications to the proposed DCO, to mitigate its local impacts. TfL said it is now 'working with local boroughs, landowners, stakeholders and other affected parties to understand the implications of these conditions, so that this vital infrastructure project can start as soon as possible'. London mayor Sadiq Khan said: 'New river crossings are vital for the future prosperity of East London, and the scheme will have a substantial impact unlocking new jobs and economic growth, while easing congestion and poor air quality in the area. Green Party London Assembly member Caroline Russell called the decision ‘plain wrong’. She said: ‘Some of the most deprived communities in east London, who do not drive, will have their lives and health blighted by this zombie road for decades to come.